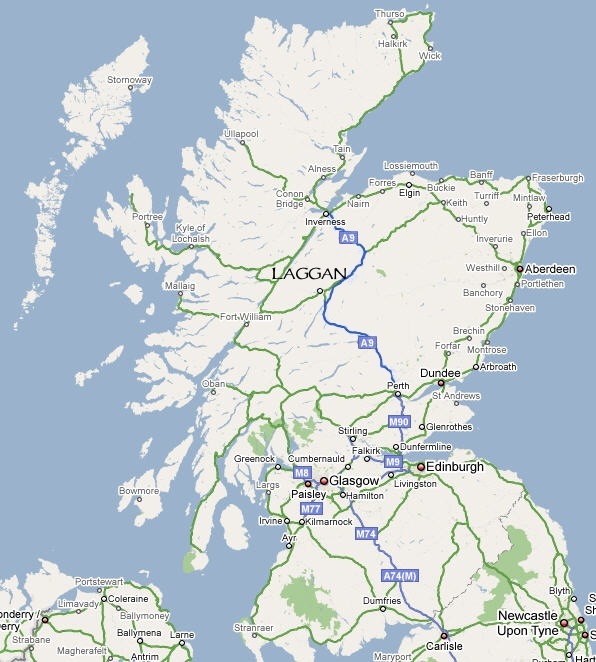 DISTANCES from Laggan ( PH20 1AH) & travel time by car to . . .
. . . Newtonmore – 8 mi (13 km) / 13 min.
. . . Kingussie – 11 mi (16 km) / 19 min.
. . . Aviemore – 29 mi (46.8 km) / 40 min.
. . . Inverness – 56 mi (90 km) / 1 hr 8 min.
. . . Fort Augustus – 51 mi (83 km) / 1 hr 11 min.
. . . Isle of Skye – 94 mi (km) / 2 hrs 10 min.
. . . Fort William – 38 mi (61 km) / 54 min.
. . . Perth – 65 mi (105 km) / 1 hr 24 min.
. . . Edinburgh – 108 mi (174 km) / 2 hrs 12 min.
. . . Glasgow – 121 mi (195 km)/ 2 hrs 26 min. 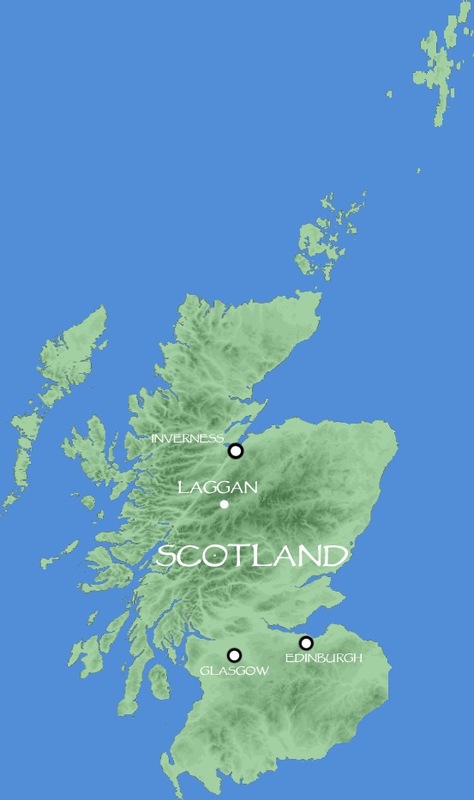 As you can see from the maps (above), we are set in the heart of Scotland’s highlands in Badenoch & Strathspey on the westernmost edge of the Caringorms National Park. Getting to us is best done by car, motorcycle, mountain bike and by foot, though using the train is still a viable but more limited option. Going by rail can be rather good if you are arriving in Scotland by plane from a distant country and are none too keen to hire a car and drive on the “other” side of the road, not to mention the car too! For all you hill walkers and way-finders we lay immediately along the East Highland Way from Fort William to Aviemore, Section 4 (49.4 mi from the beginning / 26 mi from Tulloch – the last source for amenities). As well, we are situated on the glen road of The Corrieyairack Pass (Màm Choire Ghearraig), a 24.6 mi and 10-12 hr hike from Fort Augustus to Laggan along the historic General Wade Road. Lastly, the newly established Scottish National Trail, by Cameron Mcneish, lays just outside the door. Getting around the Scottish Highlands is best by car or motorcycle as its hauntingly beautiful and variegated landscapes can be easily reached and enjoyed in mere meandering moments. A car will also provide that much needed shelter from the Scottish Highland’s midgies and always changing weather! Laggan Stores Coffee Bothy & Gallery sits at the crossroads of the A86 and the road to Gergask and Garva, right across from the prominent Laggan Church building that rests beside the waters of the river Spey. 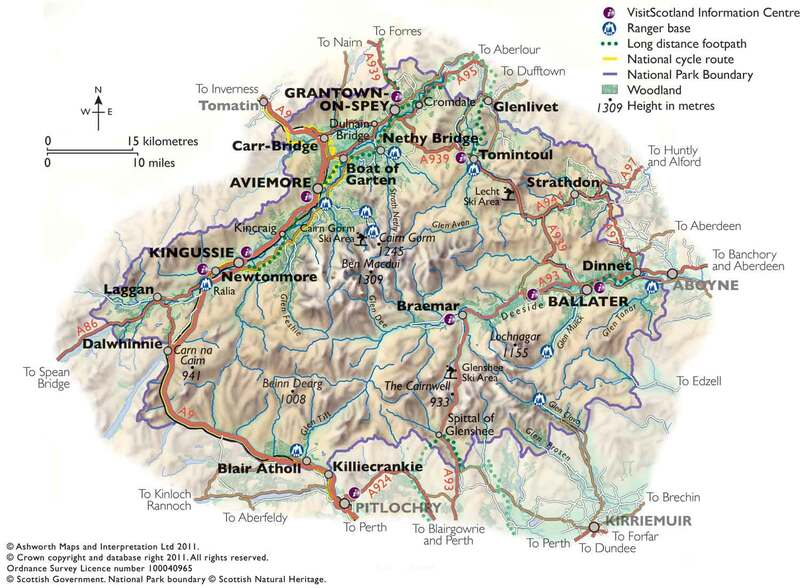 We are 8 mi /13 mins or 11 mi /18 min west of the A9 (to Inverness or Perth) via Newtonmore or Kingussis (respectively) along the A86, 8 mi / 12 min north of the A9 via Dalwhinnie (A889) and 26 mi / 36 min to the next village of Roy Bridge to the West. The nearest train station to us is Newtonmore (NWR) at approx. 7 miles east of Laggan and is a requested stop. Please use the form at the bottom of the page if you want to get in touch with us. Welcoming all who wander about in Scotland!